Ankle foot orthoses (AFOs) are the most commonly prescribed lower limb orthoses.1 The biomechanical design, materials, and components of these devices vary according to the specific function they are intended to serve, and they can be either prefabricated (off-the-shelf) or custom made from metal, high-temperature thermoplastics, or composite materials. AFOs can be static or dynamic and flexible, rigid, or articulated with a hinge that allows controlled ankle flexion. 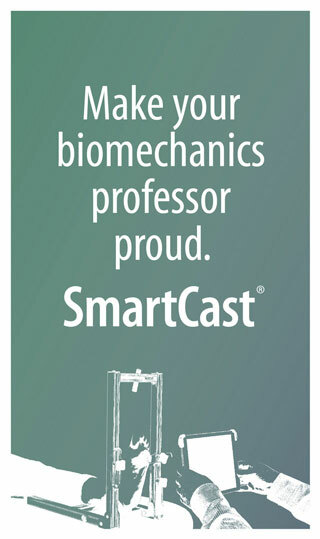 To assist and reduce the energy cost of ambulation in patients with neuromuscular issues such as spastic diplegia in patients with cerebral palsy, weakness in survivors of poliomyelitis, or spastic hemiplegia in chronic stroke patients. A proper AFO prescription considers the biomechanical influence of the orthosis at the foot, ankle, and knee in all planes of movement.1 I believe selecting the most appropriate AFO for a patient requires proper evaluation, design, measurement, and fitting during the production of the orthosis, as well as ongoing adjustments as the patient progresses or if other changes in gait, capability, or both occur after delivery of the orthosis. 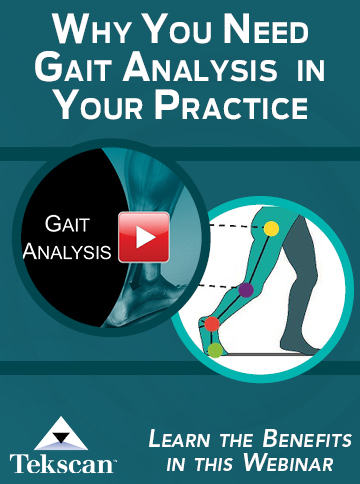 This attention to biomechanical influences should include an understanding of the multiple interfaces that exist between an AFO and the patient’s lower leg, ankle, and foot. In my experience, the design, construction, and functionality of an AFO can lead to stress on the skin and soft tissues of the lower extremity. In clinical practice, I have observed that protecting the soft tissues is often an overlooked or underestimated aspect of AFO performance: Skin interfaces are addressed primarily with foam or gel padding built into the AFO or added after manufacture, and patients often wear thin socks that offer little protection to the lower leg. While soft tissue protection has long been a major consideration in the field of prosthetics, I am not aware of any specific orthotic standard or protocol for the provision of an interface—ie, sock—between the lower extremity anatomy of the patient and the AFO. Yet, I believe that a robust interface between the skin and soft tissue and an AFO can help minimize soreness, discomfort, and damage to the skin and soft tissue as well as some of the adjustment issues that we as practitioners must address. Foam and gel cushioning built into an AFO do not always fully protect against stresses to the skin, especially in the foot region, where there is little space for cushioning. Some skin interface locations can be identified in the design and manufacture process, but not all. Issues with fitting and adjustment often are addressed after the fact, and may create unanticipated soft tissue “hot spots” at the interfaces of the AFO and the lower limb. Damage to the skin of the feet and lower legs can cause pain and discomfort for the patient, which in turn can negatively affect patient compliance with device wear. Some clinicians may not discuss the patient’s lifestyle and physical activities prior to the fitting, design, and manufacture of the AFO; therefore, the clinician may not be aware of all of the soft tissue protection requirements for a specific patient. I contend that it is desirable, even critical, to have these conversations in the initial phases of AFO fitting and design, and to establish the performance requirements for a sock that integrates with the AFO and the footwear the patient will use. Stresses on the skin and soft tissues of the lower leg and feet are dependent to some extent on the condition for which the AFO is prescribed and on the primary function of the orthosis. 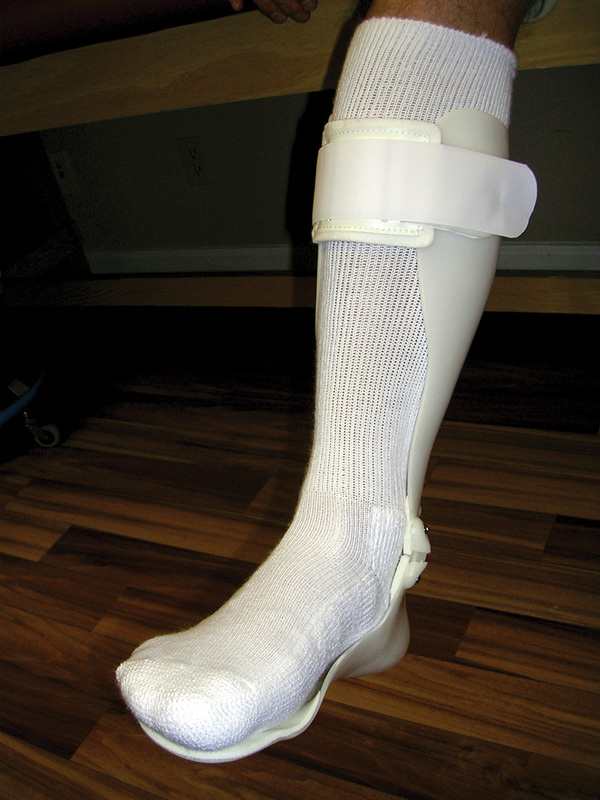 With plastic AFOs, researchers have calculated that stress is concentrated in the heel and the neck (the area on the rear of the orthosis interfacing with the Achilles tendon just below the gastroc-soleus complex) regions of the orthosis.3 In a simulation of a solid molded polypropylene AFO in a patient with drop foot, Chu and Reddy calculated that the maximum compressive stress during stance phase occurred under the heel at ground contact and moved from the center to the lateral part of the heel, with a subsequent shift of stress concentration to the neck of the AFO just prior to toe-off. 3 Although the study was done in 1995, and AFO design and materials have changed, the materials that come in contact with the skin remain hard. Polypropylene, copolypropylene, polyethylene, and other plastics are still used, and though newer carbon fibers are used, they too are hard and require an interface to help protect the skin. Therefore, it is likely that high levels of stress on the limb occur at the interfaces in the same areas of the orthosis. As noted earlier, skin interfaces are typically addressed with foam and gel cushioning built into the AFO, but in my experience these materials are not always sufficient to provide full protection against stresses to the skin, especially in the foot region, where there is little space for such cushioning. Therefore, I suggest that patients wear a padded sock to help cushion and protect the interfaces between the AFO and the lower leg, and the foot in particular. Although the primary purpose of an AFO is to facilitate a gait pattern that is as close to normal as possible in a patient who is unable to walk or run unassisted, inevitably the device changes gait dynamics. There is very little in the literature on the exact nature of these changes, but several studies provide insights into the altered biomechanics. In a study of healthy volunteers, Balmaseda et al found that the use of an AFO was associated with a 20% increase in vertical force magnitude at the end of push-off, a more posterior location of impact at heel strike, and a more lateral position of the trajectory of the center of pressure throughout stance.5 McHugh6 observed that the body-device interface forces in the lower leg are greatest when the purpose of the AFO, which in this case was designed to assist with dorsiflexor insufficiency and plantar flexor insufficiency, is to compensate for plantar flexor insufficiency in late stance. When an AFO is used in patients who lack dorsiflexion power during swing, the forces are relatively small. He also noted that, in the presence of spasticity, it is possible for body-device interface forces to be significantly higher. These observations suggest that pressure and impact patterns on the plantar aspect of the foot can change dramatically when an AFO is used to address lower extremity motor and biomechanical issues. This is important for AFO design in terms of function and the types and strengths of materials used. By implication, these observations also demonstrate the need for soft tissue protection from the changing dynamics in the feet and lower leg, irrespective of AFO type or functionality. 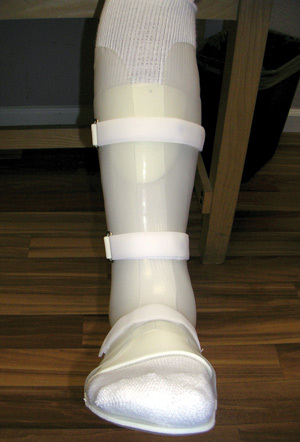 According to a recent study by Gao et al, alignment of the AFO superior or posterior to the anatomical joint was associated with increased stresses at the interface of the foot and the foot plate of the orthosis—either more normal stress (in the case of superior alignment) or more tangential stress (in the case of posterior alignment).7 However, as a clinician, I understand that maintaining the best possible alignment can be a challenge, and therefore I recommend mitigating the effects of these stresses to help reduce or eliminate the possibility of soft tissue injury. What is needed for skin and soft tissue protection, especially in cases where foot pathologies may render the foot more vulnerable to increased stresses? Doug Richie, DPM, has suggested that footwear requirements for the pathologic foot include the protective benefits of padded socks.8 Although his comments were made specifically in regard to the feet of people with diabetes and peripheral neuropathy, I believe similar requirements also are appropriate for the feet of patients who wear AFOs—at least some of whom may have diabetes and peripheral neuropathy. A body of research supports the notion that padded socks can provide effective protection against the plantar pressure and shear forces that can lead to damage in the compromised foot. Many patients are not aware of the need for protection and cannot be expected to take the necessary precautions on their own. Another study by Veves et al found that, in patients with painful rheumatoid arthritis, high-density padded socks were associated with significantly lower pressure than a barefoot condition; high-density and medium-density padded socks were both associated with significant pain relief compared with the patients’ usual socks.11 A later study by Garrow et al12 showed that multilayered socks were associated with significantly lower values for total foot pressure and peak forefoot pressure than ordinary socks in patients with diabetes at high risk for foot ulceration. However, the degree of pressure reduction was greater for the padded socks studied by Veves et al than the multilayered socks studied by Garrow et al (25% to 30% for the padded socks vs 9% for the multilayered socks). Blisters and shear force. Two landmark studies by Herring and Richie showed that padded socks reduced the frequency and severity of blisters in long distance runners.13,14 These studies were important because they demonstrated the advantages of padded socks made from synthetic fiber (specifically, acrylic fiber) over socks made from natural fiber (cotton). The studies showed the padded sock design made with acrylic fiber reduced blister frequency and severity more effectively than its natural-fiber counterpart and managed the moisture that can contribute to skin maceration and blister formation. Although these studies were done in the 1990s, they are still relevant today. Padded sock technology has not changed appreciably. Advances in engineered synthetic fibers to enhance wicking and to improve insulation, as well as nanofibers that allow the release and application of agents such as moisturizers on the skin, are illustrative of the advances in textile technology that have occurred; however, none of these advances affect the protective qualities of padded socks in reducing interface pressures with AFOs. As noted previously, acrylic and acrylic blends have been shown to have effective protective and moisture wicking characteristics. 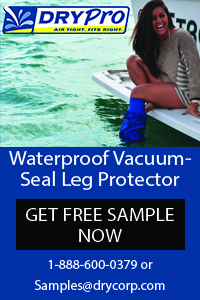 I also recommend avoiding thin nylon or other thin synthetic materials, as they offer virtually no protection for the skin and soft tissues of the lower extremity. They also can be slippery, causing the patient’s foot or leg to move around in the device, which can contribute to instability and increase the risk of a fall or soft tissue injury. I advise patients to change socks at least twice a day, and more often if they live in a warm climate or engage in moderate-to-vigorous activities. In most cases (depending on the specific AFO design), an over-the-calf sock style should be considered to help protect the tissue of the lower leg from chafing and irritation. 2. Discussion with patients about the use of padded socks before fitting. I regularly have conversations about socks, as well as footwear, when I am preparing to create an AFO. Yet time and again, patients who have had an AFO previously—or simply have worn off-the-shelf foot orthoses—will say, “Oh, I’ve never heard that before. No one ever asked me about my activities or what socks I might wear.” Many practitioners do talk to patients about footwear and the importance of making sure shoes are big enough to accommodate the AFO, but they don’t often talk about the interface. The discussion about socks should take place up front, when taking measurements for the AFO. 3. Ensuring the patient’s shoes can accommodate both the orthosis and the padded socks. Proper fitting of footwear is important, just as proper fitting and alignment of the AFO is important. If the padded sock-AFO combination makes the patient’s shoes too tight, I recommend that he or she purchase new slightly larger shoes that have sufficient volume for all the components. 4. Consider the padded sock, AFO, and the patient’s footwear as a system, in which the components work together to create a robust interface between the skin and soft tissue and the AFO. This can help minimize soreness and other foot conditions. 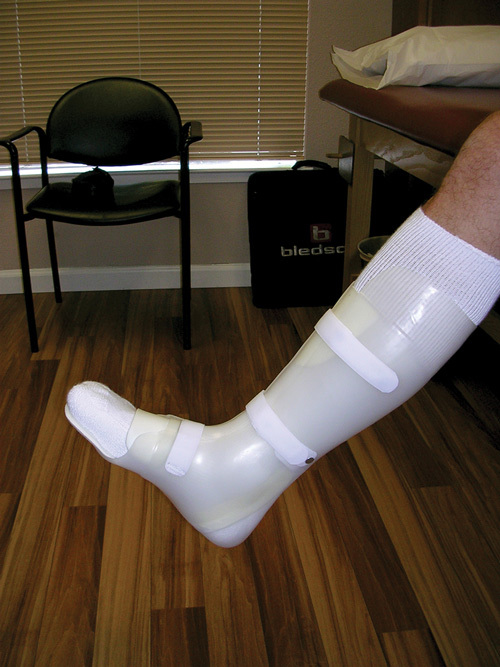 In my experience, careful attention to a system-based fitting approach—that is, choosing the padded sock, designing and fitting the orthosis, and ensuring a comfortable and effective fit with the patient’s footwear—can help minimize the need for AFO adjustments going forward. I do this by finding out what activities the patient engages in, recommending the appropriate padded socks, and taking the thickness of those socks into consideration early in the design process. Then the extra volume that will be required for the padded sock can be taken into account in the positive model before completing the vacuum forming process for the orthosis. Patients do not visit clinicians merely to be given an orthosis and sent home. They rely on us for information, education, and the assurance that their orthosis will do the job without compromising the skin and soft tissues of their feet and legs. I believe the appropriate interface and appropriate footwear working together with the orthosis, as described, can help patients through the rehabilitative or assistive process. Moreover, focusing on the interface between the AFO and the skin is not only good for patients—it actually saves time and effort for practitioners over the long term by reducing or eliminating the need for multiple visits and adjustments. Now is the time for practitioners to develop and apply standards and a protocol for the type of interface our patients should wear between their lower extremities and their AFOs. Harry “J.R.” Brandt Jr, CO, LO, BOCO, is director of Orthotics at Collier Rehabilitation Systems/Orthotics and Prosthetics in Pleasant Hill, CA, and of Northern California Medical in Sacramento and a member of the Institute for Preventive Foot Health’s Scientific Advisory Board. Braddom, Randall L. Physical Medicine and Rehabilitation. 4th ed. Philadelphia, PA: Elsevier Saunders Inc; 2011. Cuccurullo S, ed. Physical Medicine and Rehabilitation Board Review. New York, NY: Demos Medical Publishing; 2004. Chu TM, Reddy NP. Stress distribution in the ankle-foot orthosis used to control pathological gait. J Rehabil Res Dev 1995;32(4):349-360. Silver-Thorn B, Herrmann A, Current T, McGuire J. Effect of ankle orientation on heel loading and knee stability for post-stroke individuals wearing ankle-foot orthoses. Prosthet Orthot Int 2011;35(2):150-162. Balmaseda MT Jr, Koozekanani SH, Fatehi MT, et al. Ground reaction forces, center of pressure, and duration of stance with and without an ankle-foot orthosis. Arch Phys Med Rehabil 1988;69(12):1009-1012. McHugh B. Analysis of body-device interface forces in the sagittal plane for patients wearing ankle-foot orthoses. Prosthet Orthot Int 1999;23(1):75-81. Gao F, Carlton W, Kapp, S. Effects of joint alignment and type on mechanical properties of thermoplastic articulated ankle-foot orthosis. Prosthet Orthot Int 2011;35(2):181-189. Richie DH. Therapeutic hosiery: An essential component of footwear for the pathologic foot. Podiatry Manag 2013;32(8):155-162. Veves A, Masson EA, Fernando DJ, Boulton AJ. Use of experimental padded hosiery to reduce abnormal foot pressures in diabetic neuropathy. Diabetes Care 1989;12(9):653-655. Veves A, Masson EA, Fernando DJ, Boulton AJ. Studies of experimental hosiery in diabetic neuropathic patients with high foot pressures. Diabet Med 1990;7(4):324-326. Veves A, Hay EM, Boulton AJM. The use of specially padded hosiery in the painful rheumatoid foot. The Foot 1992;1(4):175-177. Garrow AP, van Schie CH, Boulton AJ. Efficacy of multilayered hosiery in reducing in-shoe plantar foot pressure in high-risk patients with diabetes. Diabetes Care 2005;28(8):2001-2006. Herring KM, Richie DH. Friction blisters and sock fiber composition. A double-blind study. J Am Podiatr Med Assoc 1990;80(2):63-71. Herring KM, Richie DH. Comparison of cotton and acrylic socks using a generic cushion sole design for runners. J Am Podiatr Med Assoc 1993;83(9):515-522. ASTM International. ASTM International Standard Table of Commercial Moisture Regains for Textile Fibers, D 1909-4. database.texnet.com.cn/db-stan/view–413.html. Published March 1, 2004. Accessed August 18, 2014.